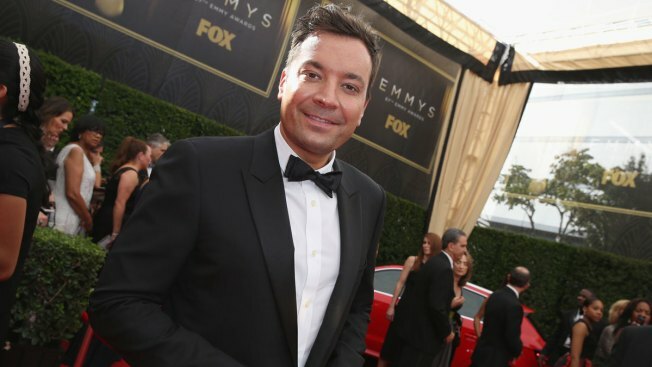 Jimmy Fallon arrives at the 67th Primetime Emmy Awards in Los Angeles. Jimmy Fallon should probably be more careful. Four months after the "Tonight Show" host needed emergency surgery to save one of his fingers after a fall, Fallon hurt his other hand in a spill at a party in his honor on Saturday. Fallon tweeted a picture Sunday of his hand with a couple small bandages on his fingers, writing that it was "nothing a few band aids couldn't fix." Nothing that a few band aids couldn't fix. The "Saturday Night Live" alum needed to have a vein taken from his foot over the summer to repair the injured finger on his left hand. He said his wedding ring got caught when he tried to break his fall after tripping on a rug. Fallon had received a humor award from the Harvard Lampoon in Boston earlier Saturday.